Camo flag picks can be used for both hot or cold food or as cupcake toppers at your next boys army themed birthday party. 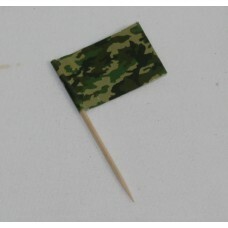 Each camo flag is made from cardboard and attached to a wooden toothpick. Pack contains 50 cocktail toothpicks. The Pirate Flag Picks have a double sided flag. One side is a skull and crossbones and the oth..
Add the finishing touches to that racing car themed boys birthday party by using black and white che..
American USA flag picks can be used for both hot or cold food or as cupcake toppers at your next par..